Ms. Happel has been teaching for 25 years, specializing in special education/deaf and hard of hearing students and students with specific learning disabilities. She has also worked with regular education students at the elementary level. Ms. Happel worked for three years as a governor-appointed education commissioner, bringing the most pressing and recent research in national education to state stakeholders. When not working hard to inspire and educate her students, or collaborate closely with colleagues, Ms. Happel trains for and races in Ironman triathlons. She has two beautiful children who are beginning their lives as young adults in college, and in mission work. Ms. Happel is available for consultation services and presentations on a variety of educational topics. She can be contacted at traciehappel@gmail.com. The phone rang, and on the other end was the principal of the elementary school I had interviewed at just a few days prior. The middle school where I had worked until the end of that school year had to lay me off due to low numbers in my special education specialty area. But, my administrators assured me, there were plenty of other classroom jobs coming open with the upcoming year. They encouraged me to apply and interview, confident I would secure a new teaching position before the summer ended and they were right. The principal was offering me a fourth-grade position in the elementary school where I had done my student teaching almost fifteen years prior. I was thrilled and accepted immediately. Within a few days, I was building my new classroom, anxiously anticipating my room being filled with cute little nine-year-olds, ready to have some fun in learning. I was also excited to be running a regular education classroom, instead of a special education classroom. There was nothing wrong with special education, mind you, but I was just ready for a professional and personal change. 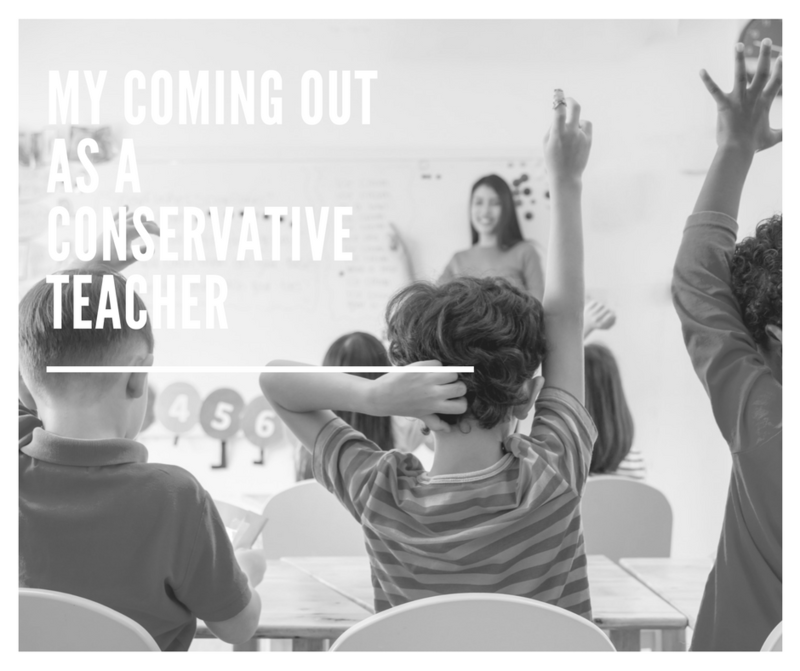 In my middle school, I was slowly becoming known as a conservative teacher. Being in a highly purple state, and a deep red county and city, conservative teachers were not welcomed. In my new school, I would shut my mouth about my political views and not say anything. Caveat: Unless of course I was asked. The first day back with teachers, I walked the halls, greeting my new colleagues. With a highly charged political environment in Wisconsin, Scott Walker who was running for governor and his proposed Budget Deficit bill, “Act 10,” was a major source of discussion. Teachers were convinced Walker would oust experienced teachers and take all their retirement monies. The discussion was so hot and heavy, I decided to call Walker’s campaign office to get the real scoop. Listening to emotional threats, misinformation, misrepresentation, and guesses was just too annoying for me for as a conservative teacher. Besides, if anyone actually did ask me what I thought, I wanted to be able to respond with an educated and informed answer, rather than with my emotions. When I spoke to a campaign worker, the person wasn’t able to answer my question so I was connected directly to Scott Walker. I asked him my questions directly and got answers that made sense. Of course, I probed and asked further questions, wanting to make sure I understood, as I knew the subject would come up and I would be feeding the wolves. I had to unequivocally know what I was talking about. And I did. I hung up satisfied with my discussion. My chance to shut my mouth. My chance to not let my new co-workers know I was a conservative teacher. My chance to carefully navigate this social conundrum. So I answered her carefully, “When I talked to Scott Walker the other day, this is what he said.” Their mouths dropped. How did I have the clout to talk to someone running for governor? They were amazed, but they listened. For many days after, a lot of my colleagues asked me to ask Walker this or that. To call his office and ask. Many times, I did. A few times I told them to call up the office themselves. To my knowledge, no one ever took me up on it. I was their connection, I was the one who talked to Scott Walker and their amazement with it likened that I was talking to God, himself. Keeping my promise, I only spoke when asked. I did not offer my opinion or thoughts unless someone directly asked me. Regardless, my colleagues slowly put two and two together and realized I supported Scott Walker for governor. I supported this heathen who was, according to the left side of politics, preparing to dismantle public education as we knew it, make poor kids poorer, get rid of teachers but not before lowering their pay to an unlivable wage. Of course, none of that was true, regardless of what the left, media, teacher unions, or bloggers say. But, I was out of the closet. My coworkers figured out I am a conservative teacher. I am on the right. I was a Walker supporter. And that is when my career as a stellar teacher began to spiral out of control. But that’s a story for another time. My new label was “conservative teacher, therefore not capable of teaching our children or serving our schools.” Life got hard. Not just for me, but for my kids, too. But was I going to do? Stop doing what I loved because of peer pressure? No. Absolutely not. That would be a terrible message to send to my children, my students, the families I served, and my community. No. Our world needs more people who think, and don’t just go along with mob mentality. I hope to never be a well-behaved woman. Instead as a conservative teacher, I will stand up for what I believe in, especially when it comes to children. Interesting. As a liberal teacher in a highly and rigidly conservative area I choose to keep my mouth shut. After hearing threats and violent rhetoric daily I am certain even a hint of my godless ways would mean a midyear release of contract and blackballing.